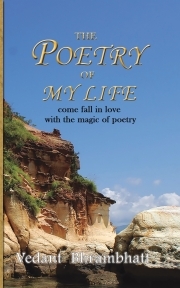 Description of "The poetry of my life"
This book consist of poems of all different types such as some of them are on social topic, some are romantic poems , some are on nature , and so on. ‘ Mesmerize me’ , ‘ You are like’ , so I advise you to read it first . I am sure that they will surely fill your hearts with he love for poetry . Also in this book I have gave an introduction about what is a poetry and about its history. Vedant Bhrambhatt is a 14 year old boy, who live in Nadiad a small town in Gujarat, India. He use to study in Bhartiya vidhya bhavan’s, a CBSE based school. He is really a passionate reader and now a passionate writer. He use write on everything what he observe, but only in the form of poetry, he use to play with words in very creative way and create a beautiful poem. He is a person who likes to create best out of anything. He always says that…. Reviews of "The poetry of my life"